Not used my ROLEIFLEX 3.5E Planar 1962 for a while. I had it loaded with one of the last ORWO NP22 1993 dated films in my fridge. I rated film at 100 ASA and processed in my Liquid PROMICROL 1+14 for 12 mins BUT this time the negs were 'Thin' -- I think the developer is too 'yellowed' now. Previously I got good negs . 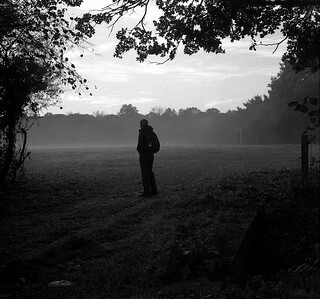 My Flickr Companion acting as 'Human Interest' on Brentwood Sports Grounds early morning.